Electric Air Fryer, Blusmart Power AirFry Oil Free/less with Temperature and Time Control LED Display 3.4Qt/3.2L 1400W Fry Basket & Recipe Book £51.99+ Free Delivery in the UK@CYUK via Amazon. Deal price: £51.99+ Free Shipping. 37% code: TQ7K6QOR ( code visible at listing). Sold by CYUK and Fulfilled by Amazon. The air fryer circulates extremely hot air and flows heat currents around food, delivering the fast and precise results. Producing delicious fried food which gets crispy exterior and moist interior with little or no oil, it cooks healthier food with up to 80% less fat. ***Smart Temperature & Time Control: The user-friendly temperature control allows you to choose the best temperature from wide temperature range (170 to 400 °F) for frying, baking, grilling or roasting ingredients to prepare any type of meal at any time. With an auto shut-off timer preset, your fryer will shut down in 2 hours as desired. ***Step-by-step Cookbook: Making great meals with a great, helpful cookbook, 29 quick-and-easy recipes guide you to create healthy and tasty food. For deep fried food lovers, air fried food as a healthier alternative, it keeps crunchy and juicy taste without added fat and calories. 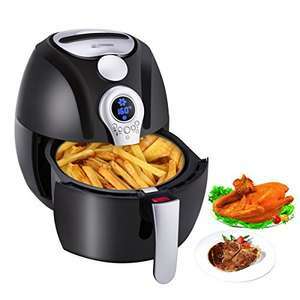 Love the airfryers, more healthy way of eating chips! You're not wrong there, I don't think I've ever seen so many images on one product. I do like how the logo is pixelated out on the official product images. When I click on it, it offers me a £30 discount that you have to click on and redeem? Looks like your instinct is right. Wilkinsons have their own one at £35.